Engage in the true spirit of celebration with this Enthralling Titan Fastrack Gents Watch that instantly uplifts the mood. 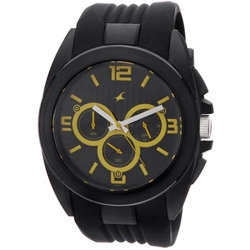 This impressionable Gents Quartz is endorsed with Chronograph Display, Black Round Shaped Dial made of Mineral Glass, Black Silicon material Band with Buckle Clasp, 9 Months Warranty. The case is made of Plastic material.